The LaPorte County, Indiana Genealogical Society will meet on Tuesday, January 13 at 7 pm at the LaPorte Parks Department Headquarters (250 Pine Lake Ave., LaPorte IN). 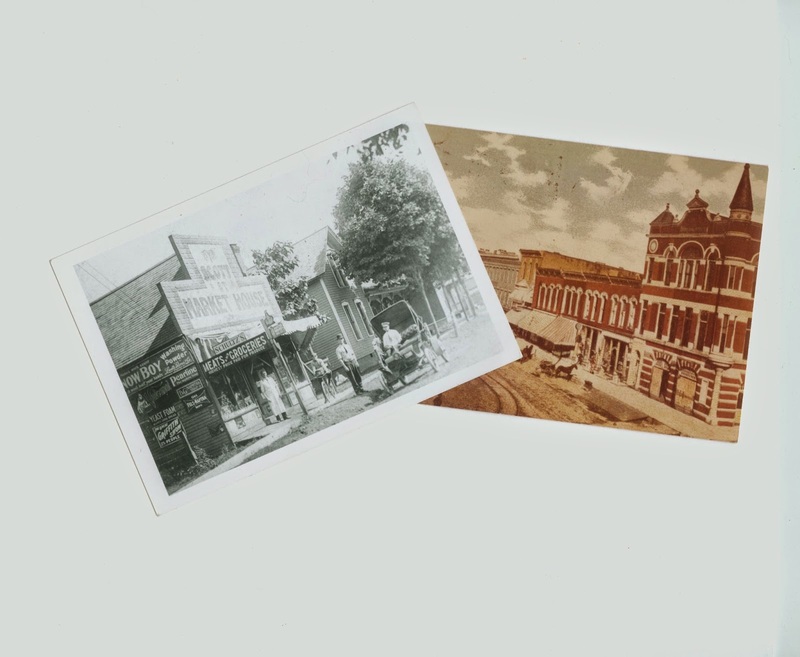 There will be a show and tell of photos - bring your old postcards or photos of a LaPorte County structure or business. You can share the story about the building or business, and the people connected to it. The Genealogy Special Interest Group (GENSIG) will meet on Saturday, January 10 at 10 am at the Goshen Public Library (601 S. 5th St., Goshen IN 46526) in Elkhart County. For more information, please contact Young Snodgrass (young.snodgrass@frontier.com). This database is free to the public - no membership is required in order to view it. It was contributed by Wayne Klusman. The Indiana Genealogical Society now has 1,430 databases in the Members Only area. Each of Indiana's 92 counties has at least 5 databases. The Indiana Genealogical Society now has 1,429 databases in the Members Only area. Each of Indiana's 92 counties has at least 5 databases. The Indiana Genealogical Society now has 1,428 databases in the Members Only area. Each of Indiana's 92 counties has at least 5 databases. The Indiana State Library is giving genealogists an early present for the holidays - digital images from a South Bend newspaper for 1913-1921 and an Indianapolis newspaper for 1895-1897 have been added to their Hoosier State Chronicle site, which is free to the public. Also, if you are an Indiana resident, you can get free access to the Indiana State Library's collection on Newspapers.com (please see their blog post for instructions on how to access the library's content). Currently the library's collection on Newspapers.com consists of some 400,000 digital images from a Logansport newspaper (1890-2006) and a Franklin newspaper (1912-1919; 1920-1946) - more images will be added in 2015. The Indiana Genealogical Society now has 1,426 databases in the Members Only area. Each of Indiana's 92 counties has at least 5 databases. The Indiana Genealogical Society now has 1,423 databases in the Members Only area. Each of Indiana's 92 counties has at least 5 databases. The Indiana Genealogical Society now has 1,422 databases in the Members Only area. Each of Indiana's 92 counties has at least 5 databases. I am searching for any information on three Civil War soldiers (especially photos or family member data if available). I live in Florida and have already obtained each soldiers' Civil Car pension records from NARA, but I do not have any of the info, letters, photos, etc. that may exist in various Indiana archives. All were in the 28h Indiana Volunteers and then 1st Cavalry (and may have been assigned to a KY unit at some point). I could forward the pension histories from the National Archives as well. NOTES: Thomas Bush was the father of Alonzo and Platoff, and he was my gr-gr-Grandfather. Alonzo had a letter writing campaign with Walt Whitman, and Platoff was later pardoned (supposedly) by Lincoln. Any help you may provide would be greatly appreciated, as my long search is now awaiting new paths to find anything on Thomas Bush. All three enlisted from Evansville, Vanderburgh County. The Genealogy Center of the Allen County Public Library in Fort Wayne will hold a free class on how best to use their catalog on Wednesday, January 10, 2015 from 3 to 4 pm. Aaron Smith, Genealogy Center Assistant Manager/Materials Handling Unit, and Melissa Tennant, Genealogy Center Assistant Manager/Public Services, will show you how to make the most of your search experience, how to locate materials in the library's physical collection as well as those items that are online, and ways to create your own lists for easier searching. This is a free class, part of the library's WinterTech series - to register, please call (260) 421-1225 or e-mail Genealogy@ACPL.Info. The Indiana Genealogical Society now has 1,420 databases in the Members Only area. Each of Indiana's 92 counties has at least 5 databases. The Indiana Genealogical Society now has 1,419 databases in the Members Only area. Each of Indiana's 92 counties has at least 5 databases. 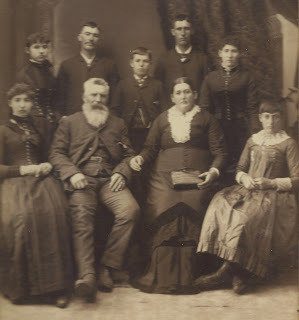 Shelley Cardiel (cardiels@comcast.net) has found this photo of the SAYRE family of Bartholomew County, Indiana, including: Elizabeth Charity; David Colvin Cora Neuton (b. 1837); Mary TABOR (b. 1842); Mary Kenton "Molly"; Annie Viola; Israel Donaldson; Robert Owen; Alfred Martin; and Jen Nettie SAYRE. It appears to have been taken in the 1880's - no studio or location is listed. Shelley's limited research has found that Mary Jane TABOR was born 14 February 1842 in Bartholomew County, Indiana to Martin TABOR (born 1811, died in Columbus, Bartholomew County, Indiana) and Elizabeth PHILLIPS (born about 1815 in Jackson County, Indiana). Mary Jane had two sisters, Lucinda TABOR and Sarah Ann TABOR. Mary Jane TABOR married David C. N. SAYRE (born 17 April 1837 in Edgar Township, Edgar County, Illinois; died 3 March 1928 in Washington or California) on 5 December 1861 in Edgar County, Illinois. --Israel Donnelson SAYRE - born August 1864 in Illinois, died 1933 in California. He married Sarah Addie ROBERTS (1867-1941) and together they had 4 children: Frank D.; Clifford George; Alfred Virgil; and Vina Mae SAYRE, all born between 1891 and 1896. --Alfred M. SAYRE - born 14 January 1866 in Illinois, died 23 November 1938; buried in Odd Fellows Cemetery in Monroe, Washington. David C.N. SAYRE (1837-1928) was one of 7 children of Israel Donnelson SAYRE and Catharine MEARS, who married on 31 January 1828 in Brown County, Ohio. David's siblings were: Robert Legate; Josiah Dixon; Lemuel Boyle, and Israel Dennis SAYRE, all born between 1829 and 1846 in either Brown County, Ohio or Edgar County, Illinois. This was Catherine MEARS’ second marriage - an earlier marriage to Robert LEGATE in 1818 had resulted in two children, John Miller (born 1819 in Brown County, Ohio) and Elizabeth Catherine LEGATE (born 1821 in Brown County, Ohio). Shelley also has 2 other photos related to this family - one of Robert Owen Sayre taken in 1910 in Seattle, Washington and one of Alfred Owen Sayre (born 18 November 1899; died October 1979 in Blaine, Washington; buried in Enterprise Cemetery in Ferndale, Washington; married Gwendolyn MAURER 1903-1995) taken when Alfred was only a couple of years old. Shelley is hoping to locate someone from this SAYRE family so that these photos can be returned to the care of family. If you are a descendant of this family, or you know someone who might be, please contact her directly. The Indiana Genealogical Society now has 1,418 databases in the Members Only area. Each of Indiana's 92 counties has at least 5 databases. The Indiana Genealogical Society now has 1,417 databases in the Members Only area. Each of Indiana's 92 counties has at least 5 databases. The Indiana Genealogical Society now has 1,416 databases in the Members Only area. Each of Indiana's 92 counties has at least 5 databases. The Allen County Genealogical Society of Indiana's Genealogy Technology Group will meet on Wednesday, December 17 at 7 pm in Meeting Room B of the Allen County Public Library in Fort Wayne. The meeting is free and open to the public. My Great-Great-GF is John Jasper Padrick, b. 1851 in Shelby County; his father is Dempsey Casey Padrick, b. 1825 in North Carolina; his grandfather is Daniel Padrick, b. 1798 in NC, d. 5/27/1887 in Shelby County and is buried in Boggstown Cem. Daniel, his wife and 4 or 5 children moved to Indiana in 1835. Daniel was an early settler of Sugar Creek Township. I would like to have contact information for any living relatives of Daniel or Dempsey Casey Padrick still living in Indiana. The Genealogy Special Interest Group (GENSIG) will meet on Saturday, December 13 at 10 am at the Goshen Public Library (601 S. 5th St., Goshen IN 46526) in Elkhart County. For more information, please contact Young Snodgrass (young.snodgrass@frontier.com). The Allen County Genealogical Society of Indiana will meet on Wednesday, December 10 at 7 pm in Meeting Room A of the Allen County Public Library in Fort Wayne. Rex Bertram will discuss how to break down the brick walls you encounter in your genealogy rsearch. The meeting is free and open to the public - at 6:30 pm there will be refreshments and social time. The Indiana Genealogical Society now has 1,415 databases in the Members Only area. Each of Indiana's 92 counties has at least 5 databases.